Lock in a great price for Puertobahia & SPA - rated 8.2 by recent guests. 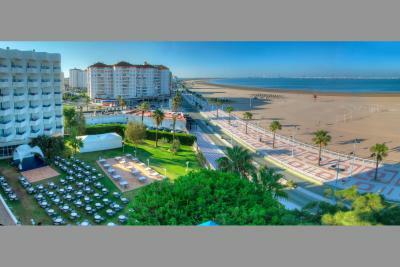 The location was great, the view was nice looking over the beach towards Cadiz. 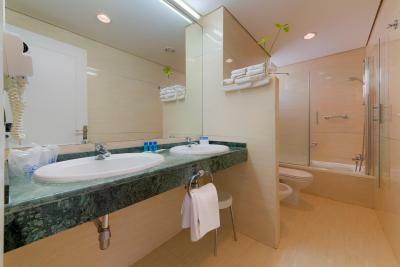 The rooms were clean and nice. 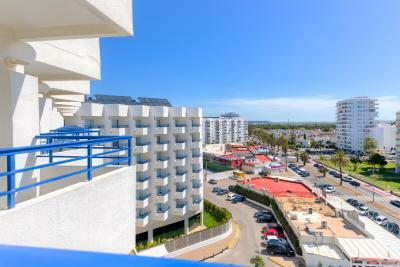 Proximity of the hotel to the beach , cafes and restaurants. 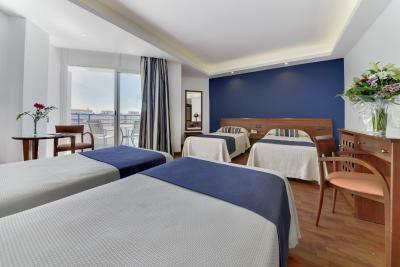 Rooms of decent size and comfortable beds. Staff friendly and helpful. the sea wiew lovely.The hotel was near to the beach . Amazing hotel with very beautiful view on the ocean! Clean, comfortable, perfect for families! Breakfast was grandiose!! big, clean, modern hotel close to the beach. The rooms are nice and modern, and the breakfast was good. Very good value for money. A large, comfortable hotel on a sandy beach. The staff is kind, the breakfast is great. 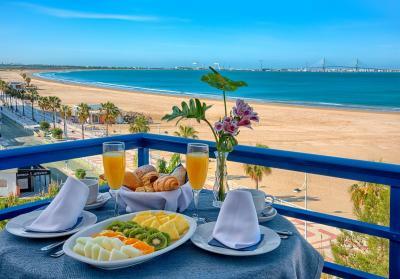 One of our top picks in El Puerto de Santa María.Puertobahia & SPA is located right on Valdelagrana Beach, in El Puerto de Santa María. 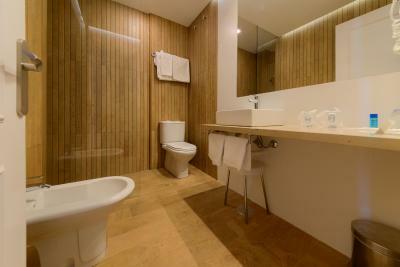 It has free WiFi, an outdoor swimming pool and spa. 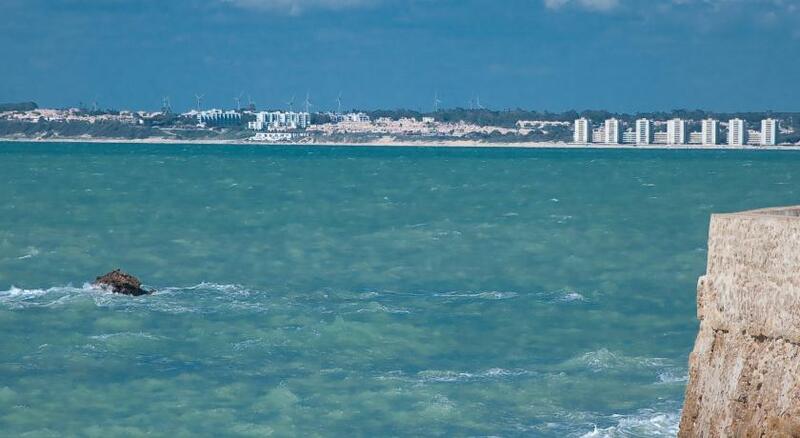 The outdoor swimming pool has views of the sea and offers sun loungers and parasols for free. 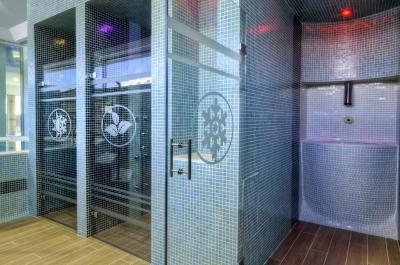 The spa includes a hot tub, sauna, Turkish bath, and fitness centre. 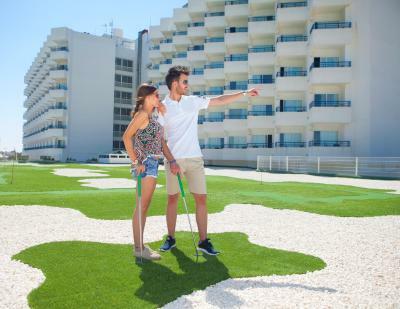 Minigolf and bicycle rental are also available at the property. 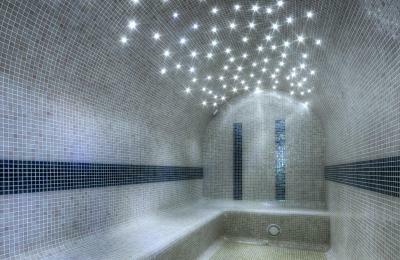 There is also a thermal pool, available to guests for an additional cost. 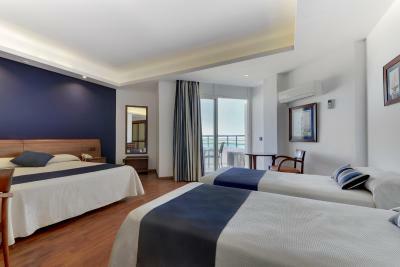 The air-conditioned rooms in Puertobahia are spacious and feature plenty of natural light. All have a 32-inch flat-screen TV and private terraces. 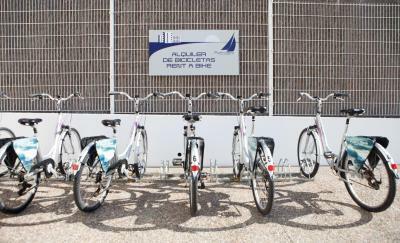 Guests can access the fitness centre free of charge. Some rooms have impressive views of the sea. Puertobahia has an on-site restaurant offering local dishes, and spacious gardens with music and live shows during summer. 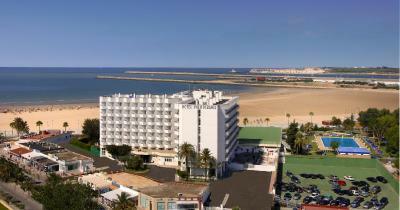 The hotel is a 5-minute drive from central El Puerto de Santa María, and about 9.3 miles from Cádiz. Jerez Airport is 18.6 miles away. 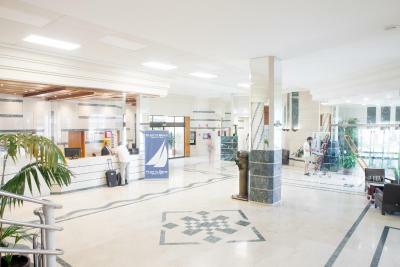 The town's train station is 650 yards away and offers links to Madrid, Seville and Cádiz. Free parking can be found in the hotel, subject to availability. 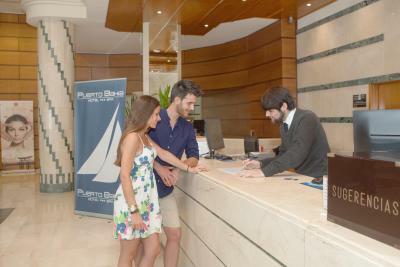 Puertobahia & SPA has been welcoming Booking.com guests since 30 Mar 2007. When would you like to stay at Puertobahia & SPA? 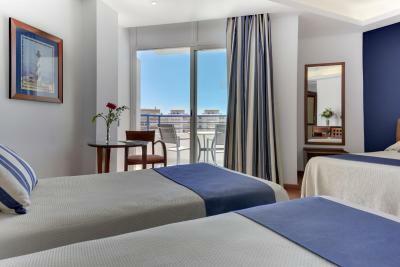 This spacious air-conditioned room has a flat-screen TV and a private balcony. It can be used for double or single use. 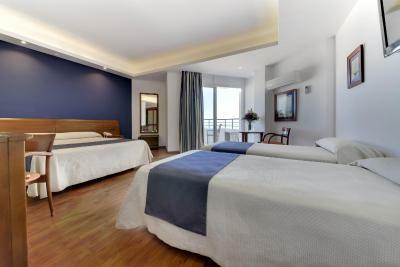 This spacious, air-conditioned room has a flat-screen TV and a private balcony. This air-conditioned room has a flat-screen TV and a private balcony. There is an extra bed for a child. 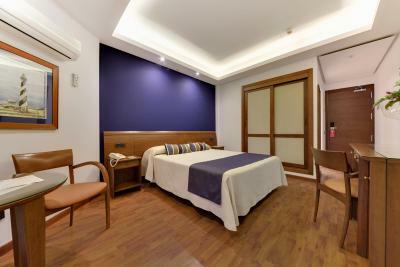 This spacious and functional room is air conditioned, and has a flat-screen TV and a private terrace. 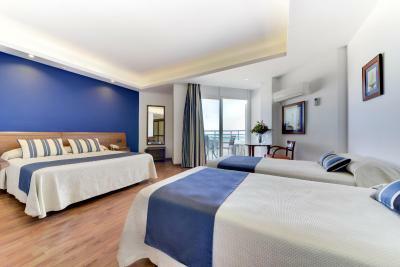 This air-conditioned room has a flat-screen TV and a private balcony with sea views. Please note that this room faces an entertaining area, which hosts live music from 22:00 to 01:00 during the summer season. 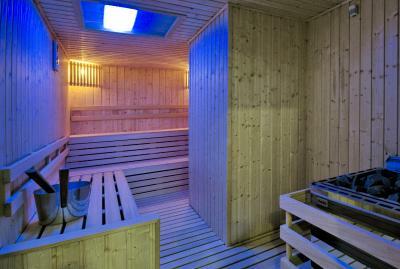 One Thermal Circuit per person per day is included in the price. 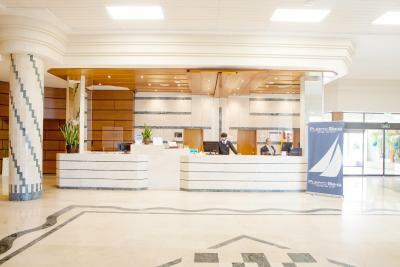 A telephone number should be provided when booking, so that the Spa can contact you to schedule the time of the Thermal Circuit in advance. Otherwise, this service will not be guaranteed. Use of swimming pool cap and sandals is obligatory. These can be purchased at the Spa. 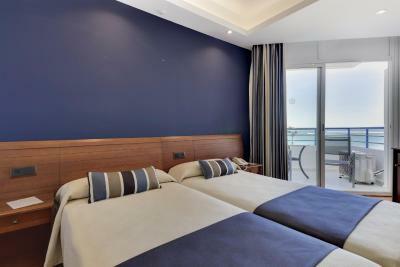 This air-conditioned room has a flat-screen TV and a private terrace with sea views. 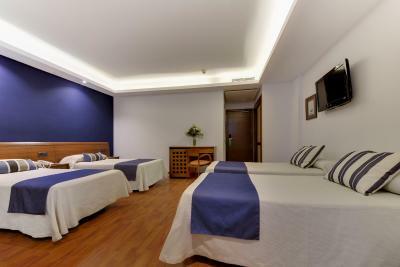 This quadruple room features a minibar, air conditioning and flat-screen TV. This twin room has a minibar, flat-screen TV and air conditioning. House rules Puertobahia & SPA takes special requests - add in the next step! Puertobahia &amp; SPA accepts these cards and reserves the right to temporarily hold an amount prior to arrival. Puertobahia & SPA accepts these cards and reserves the right to temporarily hold an amount prior to arrival. Please note that the pool opens from Easter to the end of September approximately. Please consult the hotel directly for pool opening days and times. Please contact the hotel for spa opening times. Please note that access times for children under 14 years old are restricted. 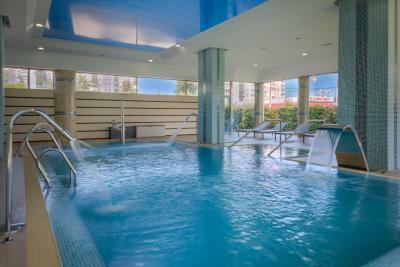 Children under 14 years old are only permitted in the thermal baths accompanied by an adult and at certain times. 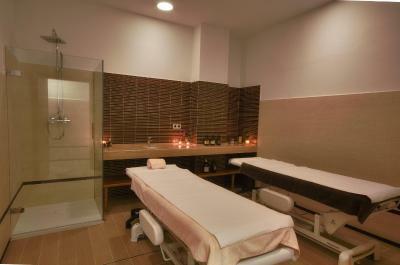 Please note that cancellation of spa services within 12 hours of the appointment carries a surcharge of 20%. Unforeseen departure will be charged the price of the night of the day of departure. Please note that children aged 12 or more are considered adults. 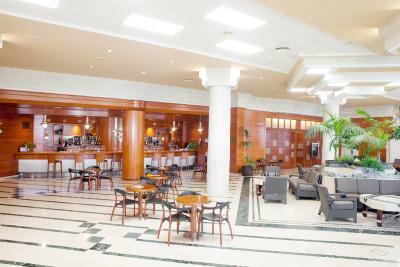 Please note that lunch and dinner are buffet style, except on days with low occupancy. Please note that the hotel may request full payment upon arrival. Please note that bed preference is available under request and subject to availability. We had to wait 30min in a queue to check in and again 25min to check out. Staff wasn't welcoming. Road and building works around the hotel. There was no warning about these before going there, or on booking. This spoilt our holiday somewhat.The noise started before we got up and meant that we didn’t feel settled or want to stay in our room for a quiet read, and certainly did not want to open the balcony door nevermind sit out on the balcony. This was disappointing as with unsettled weather we would have been content to sit out on the balcony or in the front garden out of the wind if it had not been for this noise. Also the pool and mini golf were not in use for the duration of our stay. 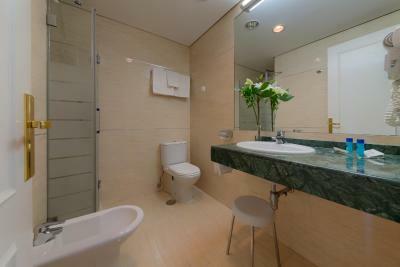 Bathroom was not clean properly, there were pubic hair in the bidet, very disappointed..!!! The hotel has terrible sound insulation in the rooms and the cleaning situation was disappointing. Our room stank of smoke and we had to ask twice to get the bedding replaced, even though it is supposed to be a smoke-free property. The outdoor pool was under construction as well as many other facilities on the property, and they started construction very early! That paired with loud conversations in the hallway at 5am and we did not sleep much :(. Unfortunately the indoor pool has very limited opening hours, and although we were told that with our spa package we would get to enjoy it somewhat privately before normal opening hours, it was filled with nice old people having a water class and then shouting at each other over the sound of the water. 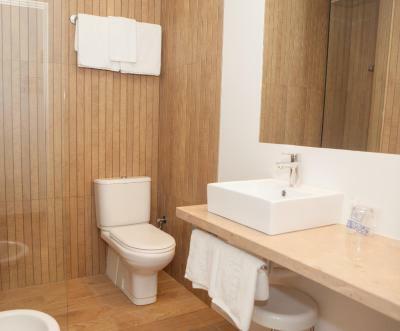 Also, on the first night when we had finally setlleed into our room and were excited to take a bath, we were disturbed to see that the bathtub clearly had not been cleaned since the previous guests. 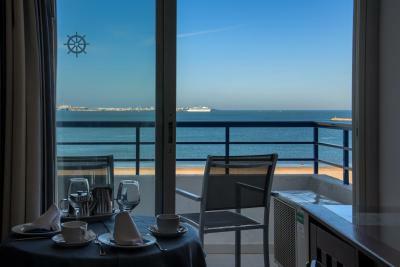 The sea view was lovely and calming, breakfast plentiful and the staff were all very friendly and tried to help at every turn. 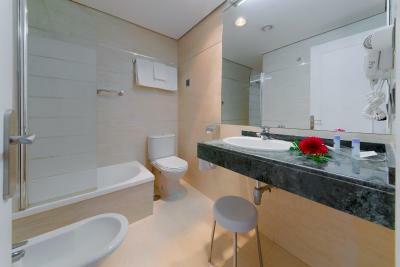 Overall the facilities were spacious and fairly modern and clean. The Spa, though poorly organized, had an excellent masseuse Jessica- highly recommended! the spa was not free. Personal in restaurant absolutly not friendly, not smiling, very bad atmosfere. Small indor swimming pool, only 1 hour on the afternoon and pay 2 euro for using pool. evening meal very average. ate out the 2nd night rather than eat at the hotel even though we were half board!! it is very good. do not doubt. book it.